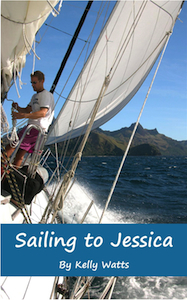 Kelly took this photo of Paul hanking a line as they sailed to the Yasawas, in Fiji. Read the Reviews of "Sailing to Jessica"
These adorable sea lions rested on the local fishing boats when not playing in the water of the Galapagos Islands. Kelly Watts at a marina in Melbourne, Australia. Don't forget to check out the huge Book Supplement section once you purchase the book. It includes bonus photos, emails from family, charts of where we went (many of these places are remote!) and videos from our trip. Fun stuff!